Happy Friday! Do you have a hot cross bun in your hand? I do. A local bakery makes some really nice ones! It's not Easter time for me without a hot cross bun. Maybe this is finally going to be the year that I finally watch 'Easter Parade'. I've been meaning to see it, oh for the past two decades or so. You wouldn't think it would be so hard to accomplish and yet, this film has eluded me. I'm going to attempt (again) to watch it. Maybe if I have a hot cross bun in each hand, I'll be lucky! Oh and guess what else. I totally was going to buy a pack of jelly beans for myself. And then I put them back. And I didn't buy any. I DEEPLY REGRET THAT CHOICE. Now I'll have to steal from my daughter and take some out of her Easter basket. Did you all see my Crabtree & Evelyn wish list earlier in the week? To add to that, how pretty is this? What an amazing Mother's Day gift it would be! 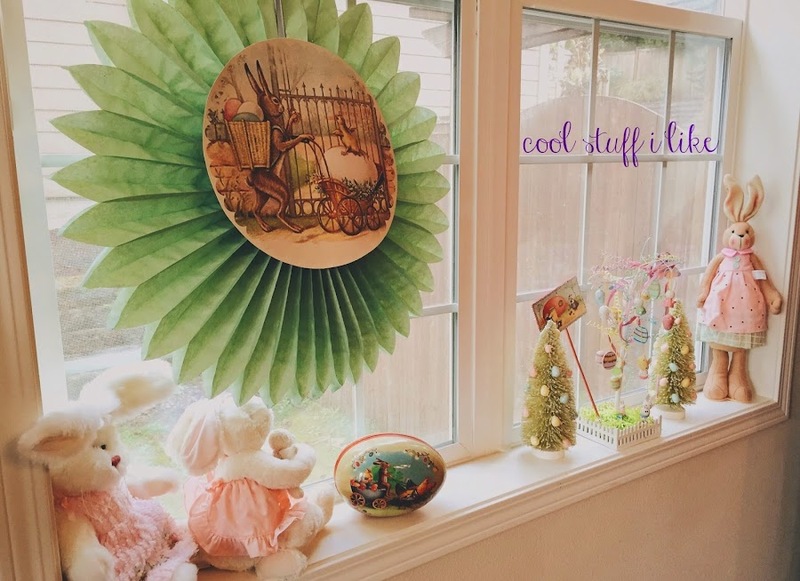 Some really cute DIY Easter basket goodies for kiddos. This book looks way neato. Cool! A live action Mulan film. Be sure and scroll down for the money shot of Alicia's adorable and cozy family room. I LOVE THIS BLOG SO MUCH. Land of Nod is now carrying Little Golden Books themed bedding and it's adorable. Creamy jasmine rice with honey and vanilla. Cool Book of the Week: 'The Ordinary Princess' by M.M. Kaye (author of the adult sweeping novel, 'The Far Pavilions') is the most fun and enchanting book, and have I shown it here before? I don't think so, because I think I was going to do a post about it. Julia and I read this together last year and it's hilarious and charming and sweet. Really fun for a read-aloud! Amethyst Alexandra Augusta Araminta Adelaide Aurelia Anne (Princess Amy) was cursed/blessed (her parents certainly think it's a curse!) by a fairy at birth....to be ordinary. If you've had it up to here with feeble princesses who need rescuing, this book is for you! Witty, charming, sweet, it's one of the best books we read last year. Great for ages 8-11. Have a LOVELY Easter weekend! Don't make the same mistake I did with the jelly beans. Hi Melissa! Reading your blog is so much fun and has a calming effect on me! I love your window decorations! Now you are giving me another reason to visit CA! Hello Kitty café? Yes!!! I totally adore that blog! Why do the cool bloggers always live in Portland, Oregon? I need to visit that city one day! I didn't know M. M. Kaye wrote kid's lit! I remember the Far Pavillion. My mom loved M.M. Kaye so much so I read her books when I was very young. Have a wonderful Easter Weekend!!! Sweet friend! I can't tell you how much I appreciate your lovely kind words. I am so rarely calm in 'real' life and it's an amazing irony to me that I could at all have that effect on anyone else, ha ha ha! I had no idea that M. M. Kaye also wrote the Far Pavilions until I was looking up the links to the book today - now I'm going to go see if my library has it!! I love your window!!!! I want to go to the Hello Kitty Cafe with you someday. Why couldn't they have the Little Golden Books bedding when my girls were tinier??? Not that it would have been in my price range, but still. Oh, can I have the Bookmobile at the bottom of the LoN screen? Is that for sale? School was canceled due to last night's severe weather, which means we can get a jump on Eastery things (no hot cross buns this year, I'm afraid - I just don't feel like it), if my kids can refrain from killing each other. I want jelly beans, too. I was supposed to go Easter basket shopping today, but that got flushed, too. UGH. No clue when I can do this now... Have a beautiful weekend!!!! I've been meaning to watch Easter Parade too. Land of Nod rocks. I almost always want everything from there. That's my kind of Easter basket/bucket. I wish I had the money to hire Posie Gets Cozy to make dresses for my daughters. seriously I wish I could hire Posie Gets Cozy to come make my house all magical like hers!! !